The more I teach, the more I focus on finding where each person's body can balance best. For a lot of people, dancing tango means finding the front of the partner's body with the front of their own body. Focusing on the front surface of each body sometimes leads to leaning, heaviness, and loss of balance. What other ways can we think of connection, in order to protect our own body and dance better? try to picture my spine in 3-D, and build my body around that. 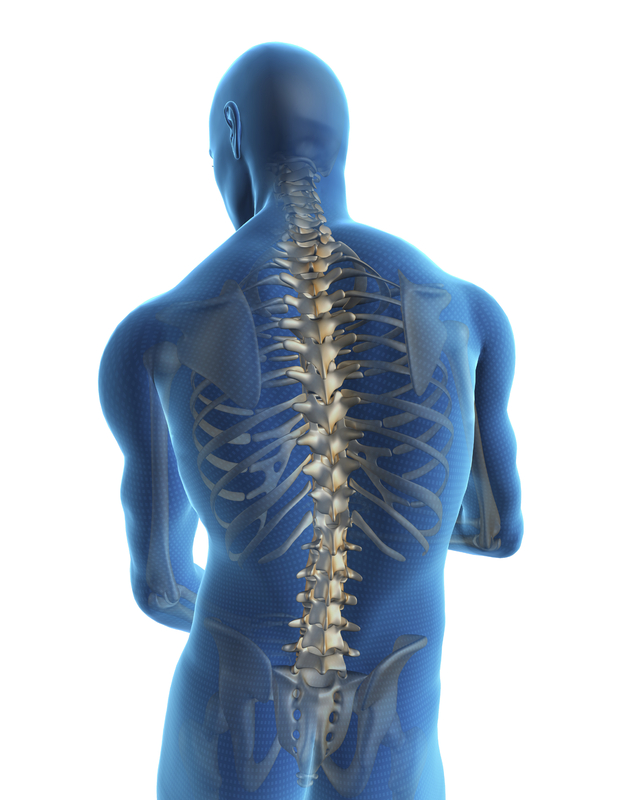 Here's a great picture of the spine in the body that might help you with the image I'm talking about. What I like here, is that you can see the ribs and the pelvis, but the feeling of all the bones being IN the body is really well done. I want my torso and spine to be aligned, nice and long, and supple, like in this picture. Front-to-back, my pelvis is balanced so as to keep my spine as relaxed and long as possible; and to let me use my deep core muscles instead of my back muscles, to hold me up. This gives me a lot more rotational movement possible around my center. My body is divided right and left, with my spine as the dividing line. That doesn't mean that there is a straight line down the middle all the time. If I am standing on one foot, that midline has some curves in it! 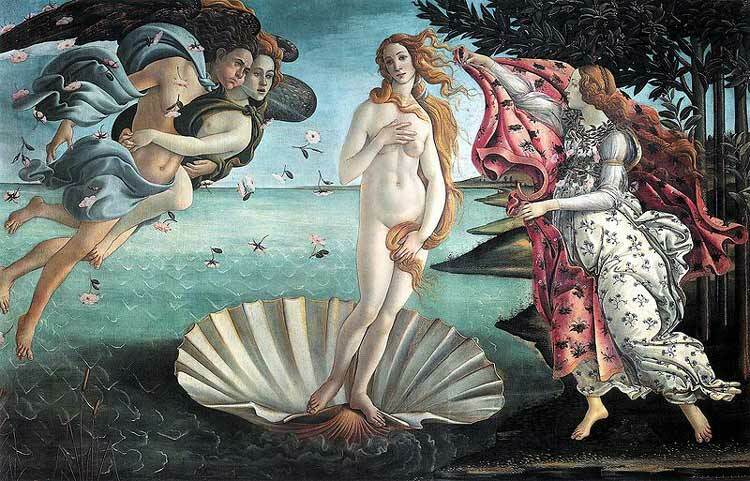 Check out The Birth of Venus! The free leg (the one she does not have weight on), is relaxed, and the pelvis is lower on that side. My pelvis is like a see-saw, with the support side up and the free side down; that tips side to side, each time I change weight from one foot to the other. My shoulders and shoulder girdle rest in a relaxed way, as if they were draped over my body. Remember that the only bony connection between your arms and your body, is your collarbone: the rest is muscle. This page might be overkill, but it does show how everything is connected. Both the pelvic girdle and the shoulder girdle have to adjust when we move, in order to created balanced movement through our midline. The more we can be efficient with motion at the periphery (away from the midline), the easier it is to remain balance in the center. If we adjust right and left at our shoulders (the metronome approach, tick-tocking from side to side with the head and shoulders) instead of the hips (pendulum swing) there is a lot more movement in order to stay balanced. Why work harder?? The midline constantly changes, balanced over one foot or the other; with a pendulum movement of the hips; and responding balancing motion in the upper body, spine, shoulder girdle and head. If this is done without motion twisting around the torso, efficient movement is impossible. Contrabody motion means the opposite side of the torso and hips/leg match up. If you have ever gone cross-country skiing, you had to do this to move :-) Right arm/torso and left hip/leg come forward, and then the other alternates. I looked for good explanations on the web, but have not found a really good one yet. Think about jogging or running, or even walking quickly as if to catch the bus: The faster we move, the more we tend to use contrabody motion, because we cannot move efficiently without it! Repeat the above exercise, with either a helper or a mirror to ensure that you are not twisting the hips. Use your thighs against each other to help you stabilize so that you don't rotate the hips (for those of you with thinner thighs, imagine that they are touching: energy does almost as much as you can with muscle, maybe more!). Continue to use your obliques. Now try walking, feeling this motion. Putting it all together is both easier and harder than it sounds. After all, you have been walking since you were a baby--but no one taught you how to walk any specific way. Look! The baby is walking! Cool! Done. As an adult, it can feel disconcerting to realize how little body awareness most of us use day-to-day. When I ask students if they can feel certain motions, I often am told, "No." Only after learning to tune into the body, can some people feel what is going on in their muscles, bones, energy, etc. For some people, even partial awareness can take years, especially if any emotional trauma is being held in the body (read: all of us). I like to think of the body as being a bunch of stretchy bands, linked together in the center of the body, working as a system to make elegant, fluid motion possible. That's the muscles. I think of the bones as a building structure, but perhaps one designed by toddlers: the bones don't stack in a straight line, but each one is held up by bones further down. The whole structure rests on the arches of our feet, which are like the earthquake cushions under skyscrapers: they adjust constantly with micro-motions, so that the entire structure might sway, but will stand up. The nerves move electricity around our bodies and that of our partners. The tango connection for me is more about this electrical field interface, then just touching (although touching is nice!). Our breath, circulation and lymph constantly pump through, connecting the other systems at many levels. The fluidity of the dance mirrors the actual fluids in our bodies! It's a complex system to balance, even when not moving, but that constant motion within our bodies is what keeps us balanced. After all, if we tried to NOT move at all, we would not be dancing!